Roughly seventeen inches long. White head and throat with tall scarlet red crest feathers. A black streak from the nostril, passing over the eyes to the back of the head and down over the shoulders. A red line below the cheek. Black upper and lower parts. Black wings with obscure white markings revealed in flight. Often mistaken for an Ivory-billed Woodpecker, although not quite as large. Inhabits forest lands in North America below 63 degrees latitude, from the West Coast in northern California and Idaho to British Colombia, east to Newfoundland, from Minnesota and Great Lakes area south to eastern Oklahoma and Texas and most of eastern US. They do not migrate. Forages under loose bark of large older decaying hardwood trees for carpenter ants and wood boring beetle larvae and sometimes insects on the ground. They also eat nuts and berries. Excavates large nesting cavities often with more than one entrance hole from twenty to eighty feet in tall trees such as oaks, sycamore, elms and pines. 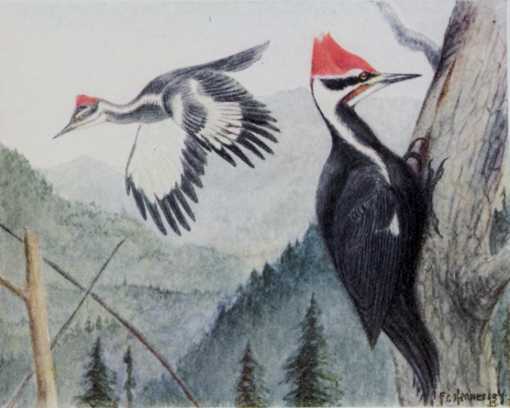 Pileated woodpeckers can live for 10 years or more. Lays three to five white eggs which hatch after about two weeks incubation and young leave the nest in about another four weeks. 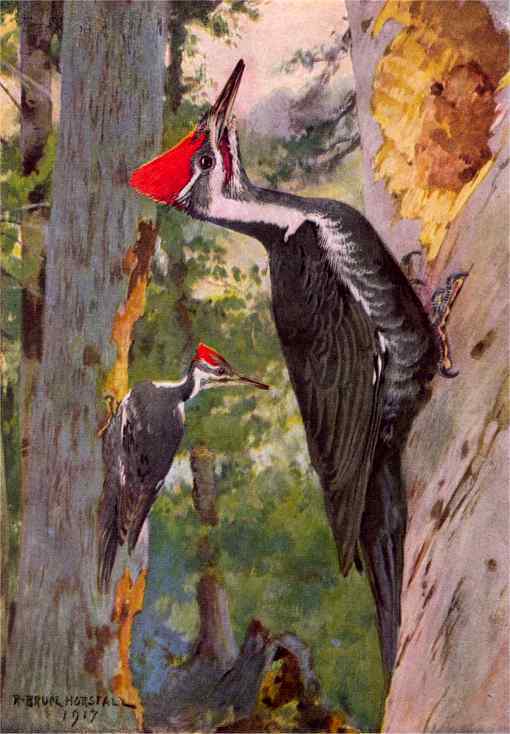 The Pileated Woodpecker Birdhouse has a 10″ by 10″ floor, 24″ inside floor to ceiling, 4″ diameter entrance hole located 21″ above the floor and ventilation openings. Assemble with corrosion resistant screws fit to pre-drilled countersunk pilot holes. Secure hinged roof with shutter hooks for easy access. Have a professional mount this box 20 feet or higher on a tree with the entrance hole facing south or east in a forest edge, or grove. Because pileated woodpeckers normally excavate their own cavities, fill this box full of wood chips (not sawdust).